I'm not going to show any photos of the little bundle of awesomeness, (how many times have I said awesome already?) but I can show you a card I made for him and the family. I had been thinking about something along these lines, but once I realized here's the perfect opportunity, it just all came together. 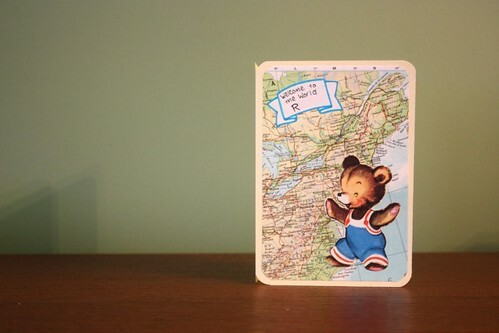 The card has a vintage map on the background, obviously showing Montreal smack dab in the middle. The teddy bear is cut from a vintage story book. The banner on the top does say his name, but since I'm not sure when it's appropriate to mention what it is, let's call him R for now. I might go see them again later today as the family needs to stay at the hospital a few days. I don't know how the food is over there, but I'm sure some extra snacks never hurt. I made some granola bars last night for a healthy snack and will take in some fresh fruit as well. As far as I noticed, all that was available was vending machines and I doubt those guys are filled with anything too fresh. I'm sure I'll get back to regular programming soon (I have no idea what that might be though, so feel free to suggest things). 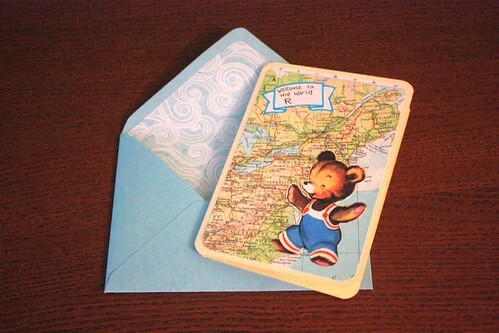 It is really entertaining to create <a href="http://babycardsnow.co.uk/>baby cards</a> especially when it is personalized. It is also possible these days to order through the web and request for a more personalized designs.